September 29, 2010  The European Union's foreign minister is traveling to the Middle East, to join George Mitchell, to try to save Israeli-Palestinian peace talks, which hit a roadblock. September 29, 2010  Teams of homeless soccer players representing nearly 60 nations gathered in Brazil this month for a faux World Cup designed to raise awareness about homelessness and offer those in need a way out. September 27, 2010  The Obama administration is still trying to salvage the Middle East peace talks despite the end of Israel's partial moratorium on settlement building in the occupied West Bank. September 27, 2010  President Mahmoud Abbas said he would wait at least a week before deciding whether to quit peace negotiations, giving U.S. mediators precious time to broker a compromise after Israel refused to extend its 10-month moratorium on new West Bank settlement construction. September 27, 2010  The Obama administration is trying to keep the Mideast peace talks alive. The Palestinians have threatened to break off negotiations, if Israel resumes settlement construction. A 10-month settlement construction slowdown in the West Bank has expired. September 26, 2010  Israel plans to resume construction in its West Bank Jewish settlements on Sunday, a move that could lead the Palestinians to suspend direct peace talks. Despite public appeals from President Barack Obama, Israeli Prime Minister Benjamin Netanyahu has said the 10-month-old curbs on new settlement construction in the West Bank will not be extended. September 24, 2010  In a speech at the United Nations Thursday, President Obama again urged Israel to extend its partial moratorium on settlement building in the West Bank. It is due to expire Sunday. The Palestinians say they will suspend peace talks, if construction in the settlements resumes. 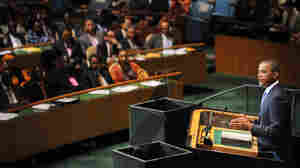 A Lesson In Contrasts: Barack Obama And Mahmoud Ahmadinejad Address The U.N.
September 23, 2010  In their speeches before the U.N. General Assembly today, Presidents Barack Obama and Mahmoud Ahmadinejad showed how different the two leaders are. 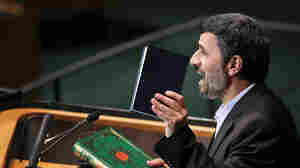 September 23, 2010  As Iranian President Mahmoud Ahmadinejad addressed the United Nations General Assembly, several dozen delegations, including representatives of the U.S. and European nations, left. September 23, 2010  One year ago, President Obama appeared before the United Nations General Assembly to usher in what he called a new era of American engagement. On Thursday, he was back in New York, asking world leaders for their help establishing a lasting peace between Israelis and Palestinians. Obama Spells Out Foreign Policy Goals At U.N.
September 23, 2010  In his address to the 65th U.N. General Assembly, President Obama laid out his foreign policy goals, from Middle East peace to improving the global economy. But how are his goals being received around the world? September 23, 2010  The president presented a broad survey of global hot spots, but used much of his speech to promote U.S.-led efforts at reaching a Middle East peace deal. An independent Palestinian state and a secure Israel are achievable within a year, Obama said. September 23, 2010  President Obama goes before the United Nations General Assembly Thursday morning for a second time in two days. 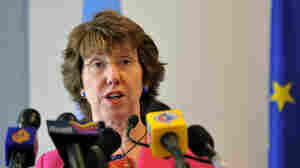 On Wednesday, he laid out a new direction for U.S. development assistance. He said he would step up his commitment to fight hunger, poverty and disease. September 22, 2010  President Obama says he's overhauling the way the U.S. aids poor nations around the world and stepping up its commitment to fight hunger and disease. Robert Siegel talks to NPR's Michele Kelemen about the president's U.N. speech.